"We're all witnesses to something or someone," writes Crandall. "As Christians we're Christ's witnesses. It's our identity, not merely something we do or don't do." Witness guides you to learn more about your faith and to speak invitationally with others about beliefs. Crandall has outlined a 25-week small group study that focuses on the important parts of faith. Through Bible study and group interaction, you'll identify your gifts for ministry and learn to witness to others in a natural and effective way. 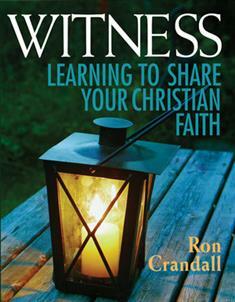 "Witness is the perfect resource to persuade people that witnessing is a personal (and possible!) faith mission. Using Witness as our sole programming … helped our members achieve a greater comfort level in faith conversations," wrote one pastor. Embark on a journey where you'll be challenged to discover who you really are, what you believe, and what really matters in your life.